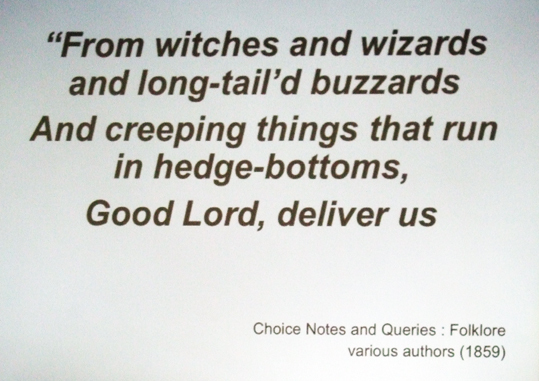 This wonderful old charm was just one of the traditional spells and folk-sayings related by Andrew Mercer at The Nameless Arte, a conference on Traditional Witchcraft in Britain, in Southend-on-Sea, Essex, yesterday. I photographed this slide from Andrew's talk and took lots of other pictures and notes and I'll be blogging more about the conference in the future, but I couldn't resist just posting this one today as a teazer! The traditional charm is also one of those included in a book by Andrew Mercer called The Wicked Shall Decay - Charms, Spells and Incantations of Rural Britain, which is due out in a few months. I can't wait to get a copy! Other speakers at The Nameless Arte were Gemma Gary, Richard Ward, Michael Clarke, Martin Duffy and Andrew Collins. Sorry does the above say "Dog's Bottom for Scrying into"?? ?